The night I arrived in Germany I had a terrible fall, slipping forwards down some wet metal steps, crushing and twisting my already damaged right knee. Up until then the knee had been going well and I was feeling particularly fit after the Baja ride. It swelled immediately and I could barely walk and not without restriction or significant pain. From that time there were six days until I would be required to cycle again, so I hoped the rest and self-treatment on the ferry and travelling time in the truck would enable it to recover enough. After five days it was reasonable and I managed to do a little snow cycling to shoot a new promotional video and had only a small, manageable reaction. When we finally found some significant snow to cycle on, I limited myself to just 20km so not to overdo it. The knee was struggling though after about 5km, but I thought I could push through it, as I often do. The following day I had a significant reaction. It was evident that it had not healed enough and was probably going to take a few weeks to recover. This is of course both frustrating and worrying. I took the decision to give it the rest it needs; I cannot afford to compromise the project by doing more damage. We therefore have decided to try to make the most of our time here and see as much as we can of this amazing, scenically dramatic island in the middle of the North Atlantic. From Egilsstadir we headed to Iceland’s most northerly point, Hraunhafnartangi (pronounce this! ), taking in some snow-covered highlands and remote farm and fishing communities. To reach the most northerly tip, just three kilometres below the Arctic Circle, we had to park the truck and walk (slowly and carefully for me) about 1500m along a stony track to a rather modern, hi-tech looking lighthouse. The track was littered with non-biodegradable rubbish washed up from the sea; plastics, pieces of nylon fishing nets and ropes appear to bind the grey stones together. I guess the debris is an indication of just how much trash is floating in the cold Atlantic waters around here. The headland was protected by a barrier of stones to break the waves. Nestled in between the barrier and the lighthouse, the ruin of a tiny grass-roofed hut was a reminder of the remote, harsh circumstances in which many would have lived in years gone by. We continued our tour of the Melrakkasletta Peninsula along a potholed gravel road to a well-serviced fishing port called Kopasker and then taking in a spectacular coastal drive, a further 100km or so to Husavik, a more major centre in the region, (population around 2500). Yesterday we played tourist once again and ticked three important boxes in the volcanic Myrvatn region of north east of Iceland. Volcanoes and geothermal activity are synonymous with the lake environs which sits along the divide between Europe and North America. First we explored around Hverfjall, a perfectly formed volcanic cone, about 1500m in diameter. Namafjall, about five kilometres from Hverfjall was the highlight for me – a dramatic geothermal area with fumaroles and boiling mud pots. 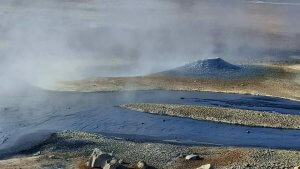 Steam and fumarole gases, the most distinctive being hydrogen sulphide (smells like rotten eggs) bellow from the ground under pressure – 1000m below the temperature is 200C. About an hour’s drive away were the Dettifoss and Selfoss waterfalls. At this time of year, melting snow drains into the Jokulsaafjollum (river), first over the smaller Selfoss and a few hundred metres later, thunders down the mighty Dettifoss, Iceland’s most powerful waterfall.